Great looking embroidered black and white baseball cap! 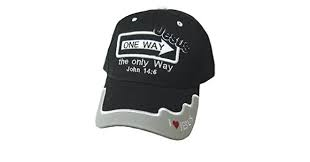 Features a One Way sign and I ♥ Jesus on a gray brim. Jesus, One Way - The Only Way. John 14:16. Adjustable, one size fits most people.